Invigorating, Calming, Anti-aging, Anti-inflammatory, Immune-regulating, Respiratory Tonic, and a Digestive Aid All in One Super Supplement. Gynostemma pentaphyllum is a quintessential adaptogenic herb. 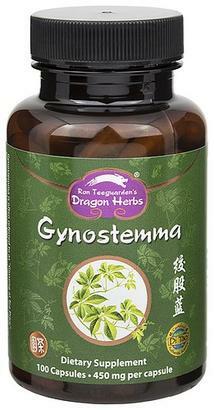 Gynostemma is also known as "southern ginseng" and the "miracle green." The delicate bright green leaves of the low growing plant are regarded as one of Asia's premier longevity herbs. Currently one of the most popular herbs in all of Asia, it is an adaptogen and antioxidant. It supports the healthy activity of the immune system. It is traditionally used to help support and maintain normal healthy respiratory, cardiovascular, digestive and liver functions. The highly concentrated powdered extract is made from the purest, highest grade Gynostemma, grown near the top of Great Immortal Peak, a remote pristine mountain in Southern China, without the use of any chemicals. It is grown totally on mountain spring water and natural precipitation. The primary active constituents of Gynostemma are known as gypenosides. Dragon Herbs Gynostemma contains over 100 naturally occurring gypenosides. It is one of the great herbs in the world. Most of the Gynostemma sold in the United States is grown at low altitude as an adjunctive farm product, usually around corn fields. The water in these farms is not nearly as pure as the fresh mountain Spring water that feeds the Great Immortal Peak Gynostemma plot. Also, the common low lying fields are fumigated and unnaturally fertilized. Ingredients: Gynostemma pentaphyllum leaf extract (Organically Grown, Certified by ECOCERT). Other Ingredients: Vegan capsules (non-pullulan based), rice hull extract, certified organic non-GMO maize starch. Gynostemma pentaphyllum leaf extract (organically grown, certified by ecocert).